Let me start by saying I am not an expert email marketer. I also don’t offer email marketing services. I am not affiliated with any of the companies I will be mentioning, and I don’t work for an ESP. I am just your regular hater email marketing recipient. I’ll be showing you a couple of emails I have received from companies here in the Philippines. I’m not sure they did email client testing or if they did research as to what email marketing best practices are. 1. They don’t use recognizable “from” email addresses. The email is from a certain Grethel Almazar. How in the world am I supposed to know who that is? And what a catchy subject line! Pizza Promo! Let me read this! I don’t know who it’s from but it says Pizza Promo so I’ll read it right this very second! NAT. Only after I click the email will I see that it’s from S&R. This is a big company, why can’t they invest more time in figuring out how to properly send emails to their customers? 2. They send purely image-based emails. S&R did this. As you can see up top, it’s just an image that they attached as if it were an internal email sent to their coworkers. If they have 2 or more items in there that looks “clickable”, I can’t click it because it’s this one big chunk of image. I can’t read the text if HTML is disabled which means when I first open the email, I won’t see anything. I will just see a big empty box and Yahoo or Gmail asking me if I want to display the image. Lastly, if I want to copy and paste the text, I also can’t do that. It’s so simple. 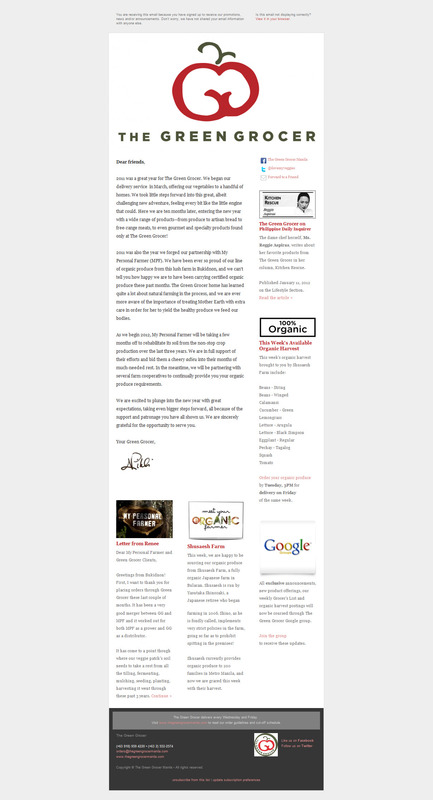 If there’s text in your email, especially if it’s long, don’t embed that in an image. You’ll see blue in there because I highlighted it and I wanted to show you that if I tried to highlight say, a specific name in there so I can Google it, I can’t because it’s one. big. chunk. of image. See how long that is? I can’t even click on their sponsors. I won’t include emails from daily deal sites anymore as I’m sure they follow email marketing standards – after all, they rely heavily on email marketing. Segmentation is where they need help but I don’t really feel like showing you an email from Groupon or Ensogo. I’m pretty sure you also get that daily or have already unsubscribed. Now here’s an email from The Green Grocer. Another email sender I like is Wunderlist. I know they’re not a local company but their emails are just so simple and beautifully designed. They don’t use any special ESP either. They use MailChimp which anyone and everyone can use now. Are there any other Philippine companies out there that send good marketing emails? Or if you’re a hater like me, really bad ones? Ha! Next Got unfollowed, unfriended… rejected? Two reasons to not feel bad.